We come to the end of Fred’s story. Part 3 concluded with the orphanage agreeing to take in the Stevens children. Will FRED’s birth certificate be found so that Veronica can get her visa? After doctor’s certificates were procured and the children vaccinated, arrangements were made for them to travel from Ireland to London. They were met by relatives, who brought them by train to Bristol and their home at the New Orphan Houses. The entire process took about 6 weeks from the time of their father’s death. Records show that only the four sisters were admitted. Frederick and his brother were not. Family members must have taken them in or made other arrangements, rather than placing them. Or perhaps Müller was willing to take only the girls. We know that Frederick was living with his aunt and uncle 3 years later in 1881. The sisters lived at Müller House until they were about 17 years old. Upon dismissal, each one was sent to a private home in the London area for employment as a domestic. 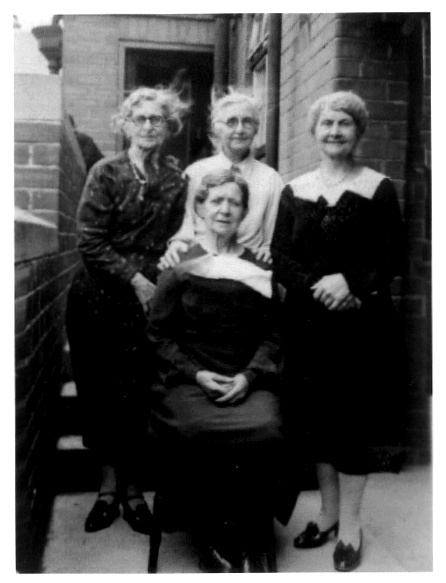 The four Stevens sisters on the occasion of Mary Alice's 70th birthday in 1936. It was the first time they had all been together in 40 years. Martha, Rosina, and Annie are standing; Mary Alice is seated. 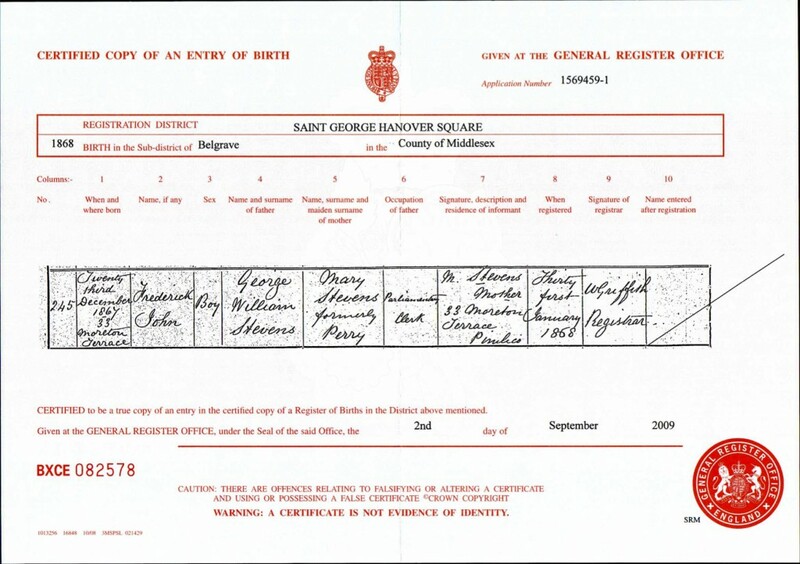 Using the information found in the orphanage records, I ordered a copy of George Stevens’ death certificate by fax from the Irish General Register Office in Dublin. I also sent for his marriage certificate and his wife Mary Stevens’ death certificate online from the General Register Office in Southport, England. Now came the challenge of finding Frederick’s birth record. Through a process of elimination, I narrowed down the possibilities for his birth registration from the indexes on FreeBMD, and ordered the one I felt was most likely his. My hunch was correct. It turns out that in all instances, the estimates of his birth year (1868, 1870, and 1872) were wrong. Although his birth was registered in 1868, he was born in 1867. After the civil registration of births, marriages, and deaths was introduced in 1837, parents had 42 days to register a child’s birth at no charge. Frederick was born on 23 December 1867, and his birth was registered on the last day of January, 1868. Without the information from service records, the censuses, certificates, and the orphanage, finding Fred would have been nearly impossible. My research for Veronica was done. I sent her the service records, the civil certificates, and the papers from the orphanage. With her grandfather’s birth certificate and other documentation, she applied for and received her visa. She and her husband eventually sold their house and moved to England. Like her grandfather and so many other immigrants, she made the difficult decision to leave family behind and settle in a new country. Who could have envisioned that when Frederick Stevens left England for South Africa in 1889, his granddaughter would one day make the return journey?